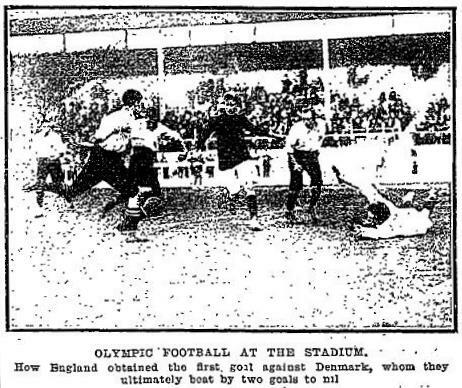 Before the FIFA World Cup of 1930, the Olympic Games football tournament represented the first organized attempt to stage a world championship. Even as early as 1908, that’s precisely what it was, featuring the United Kingdom, France, Holland, Sweden and Denmark. Only the withdrawal of Hungary and Bohemia before the tournament started prevent 1908 from boasting a full house of serious footballing nations of the time. British football was familiar with continental opposition, and British coaches worked in Europe, but the Olympic experience was a contrast to the usual experience of the British, the only country to play their sport on a genuinely global scale. One way to interpret the four home Associations’ suspicion of the nascent FIFA is to remember that to join what was then a Europe-only organization was to seriously narrow your horizons. The Olympic games are over, and have, I think, come to an end to the great relief of everybody. I take it we won’t have to watch out for his shade, then, come 2012. They didn’t have to in 1948, or if they did, the reports have been lost..
France sent two teams, and one of these met Denmark on Monday; but the result only served to demonstrate that our French friends are never likely to do much at our winter game. (..) What struck one about the French side was that they were too polite, and too fond of smoking the eternal cigarette. They puffed away right up to the start of the match, and in the interval had another smoke, finishing up the day by repeating the practice. How different with our sides! Why, when I had an important match on, I did not smoke for a day or two before or a day after; but our friends do not believe in this. It was impossible from their two displays to believe that the game will ever make much headway in France. (Ed: more on JC and smoking here). Mr Charles Williams, who trained Denmark, is not only a very able tutor, but he has also had the advantage of very wide and varied experience. Last year he was the goalkeeper for Brentford, but before that he had been at Norwich, Woolwich, Tottenham and Manchester City. He is one of the few players who can take the platform, and also write a very readable article for the Press. He has lectured to referees, is a good wicket-keeper, a total abstainer, and a member of the YMCA. (When “Charlie” Williams – the first keeper to score from open play with a Shilton-esque long punt at Roker Park – signed for Spurs, it was at the behest of the Spurs manager, one John Cameron). He was born at Blackburn nearly forty years ago, made a great name with the Rovers, and improved on it when he joined Everton, in whose ranks he was when he began his international career. He then came South, and joined the “Saints,” and was a very great favourite at Southampton. After, he went to Liverpool. As an inside-left he was one of the grandest players that ever stepped on the field to do battle for England. That’s to understate matters. Chadwick played for both Blackburn teams, Everton, Burnley, Saints, Liverpool, Blackpool, Glossop and Darwen. The move to Southampton is the interesting one here, because it coincides with the Football League’s imposition of a maximum wage. Chadwick followed the money. Even then, Saints were a club with a ceiling on their growth. The board looked towards London, and heard the brass calling. When Chelsea was founded in 1905, it stole the Dell’s chairman, manager and a number of players. Chelsea’s first captain was John Cameron too, but not our one. Chelsea’s was an Alf Ramsey lookalike whose prose style was eerily similar to his namesake’s. At the turn of the century, the Football League was considered as a Northern, not a national, league – and creation of a “national” league was the subject of some debate. Cameron favoured a split between North (Football League), South (Southern League, including Southampton) and London (for whom he favoured a separate division). The Southern League, able to pay players above Football League rates, became a real competitor for a brief period, which saw Southampton reach an FA Cup Final, and Tottenham, led by one John Cameron, actually win the trophy outright. Sheffield United were the afterthoughts on both occasions. It didn’t last: the Southern League soon had its own maximum wage, and football sealed itself off from middle class involvement for the rest of the century. Only now, in the form of Frank Lampard, do we see the best kind of public school man bringing proper values back and leading the line for the old country. Cameron was right about the Dutch, in the end, but not for more than half a century. Dutch football remained in a kind of amateur doldrums right through to the emergence of Cruyff and Ajax. Nevertheless, Cameron saw something in the 1908 Dutch – was it anything like what would come all those years later? What, however, surprised everybody, was the excellent form shown by the Dutchmen against the United Kingdom, and it came as a distinct surprise. During the first half it looked a very open matter. The visitors had a splendid goalkeeper, and a very good half-back division, and had the Holland side been as good in front of goal as in the mid-field they would probably have won… It must be remembered that for forty minutes the Dutchmen kept out their opponents, and this in itself was an excellent performance. Hague, Rotterdam, Dordrecht, and Delft have all excellent clubs, and there appears to be a very bright future in store for the game. One of the most delightful episodes of the week was the way in which, after their defeat, the Swedes turned round and gave three hearty cheers for the English side, who appeared quite taken by surprise, and responded in a very half-hearted manner. But all through the week the attendances have been so bad that it was almost like looking for the needle in a haystack to find out where the people were. It’s at that point that Cameron, a Scot, stops referring to the “United Kingdom” and reverts to his native “English”! The English they were – the 1908 winners were the England Amateur side playing as “Great Britain” (not as Cameron’s “United Kingdom”). Something there for a Scot, or a Welshman, or at the time an Irishman, to resent. “England” – calling themselves England this time – retained the trophy in 1912. They haven’t shut up about it since.